All of Pulse Commerce real-time shipping calculations are by weight, so if you use real-time shipping carriers the fees will be calculated by weight automatically. However, Pulse Commerce allows you to configure specific custom shipping methods based on the product price as well. Note: The price of each product is entered in the Product Editor (Products > Product Catalog Manager). Go to Settings > Ship Methods & Rates. Click the Custom Shipping or Advanced Custom Shipping - International tab. Note: The Advanced Custom Shipping - International tab allows you to create custom shipping methods specific to countries. Beyond that, the two tabs function the same. Ensure that By Price is selected. Click Add New. This new method is added above the Add New Shipping Option header. Once created, Edit Rates to specify one or more price ranges. Click the help icon on the page for detailed examples and instructions. 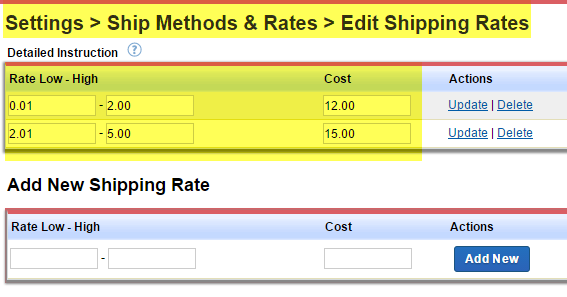 Create a new By Price custom shipping method. Name it Free Shipping on orders over $300. Add only one rate bracket, with a min of $300.01, and a max of something ludicrously high. Let's say, $10,000,000. Set cost to 0. Now the customers can see this as an available shipping method, but only if they have at least $300.01 of merchandise in their cart. When they select this, they will be charged $0.00 for shipping.